I arrived in Crete last month just days after Orthodox Church leaders had concluded an historic council in which they pledged themselves to dialogue with other churches, while also reaffirming that there could be no compromise when it comes to Orthodox teachings. The Pan-Orthodox Council, officially styled the Holy and Great Synod, brought together Patriarchs, bishops and theologians from most of the recognised autocephalous or autonomous Orthodox Churches, and they met at the Orthodox Academy of Crete in Kolymvari, outside Chania, last month [19-26 June 2016]. The council was a talking point in Church circles in Crete throughout my time there, circular letters about the council from the Bishops of Crete were available in all parish churches, and the council is going to have considerable impact on discussions and debates in Orthodox churches and theological circles for years to come. The 10 Churches that sent representatives to Crete were the Ecumenical Patriarchate and the Orthodox Churches of Alexandria, Jerusalem, Serbia, Romania, Cyprus, Greece, Poland, Albania, and the Czech Lands and Slovakia. The Council concluded on 26 June 26th 2016, the Sunday of All Saints, with a Patriarchal Concelebration. Patriarch Bartholomeos presided at the Divine Liturgy in the Church of Saint Peter and Saint Paul, in Chania, in concelebration with the other Orthodox Primates present. “The Orthodox Church, faithful to the unanimous apostolic tradition and her sacramental experience, is the authentic continuation of the one Holy Catholic and Apostolic Church as confessed in the Creed and confirmed by the teaching of the Church Fathers,” the final statement declared. “The Orthodox Church expresses her unity and catholicity in council – conciliarity pervades her organisation, the way decisions are taken and determines her path,” the message continued. The week-long Council, probably the first council on such a scale for 1,200 years, ended on 26 June with a celebration of the Divine Liturgy at the Basilica of Saint Peter and Saint Paul, presided over by Ecumenical Patriarch Bartholomew I of Constantinople, who convened the Council. 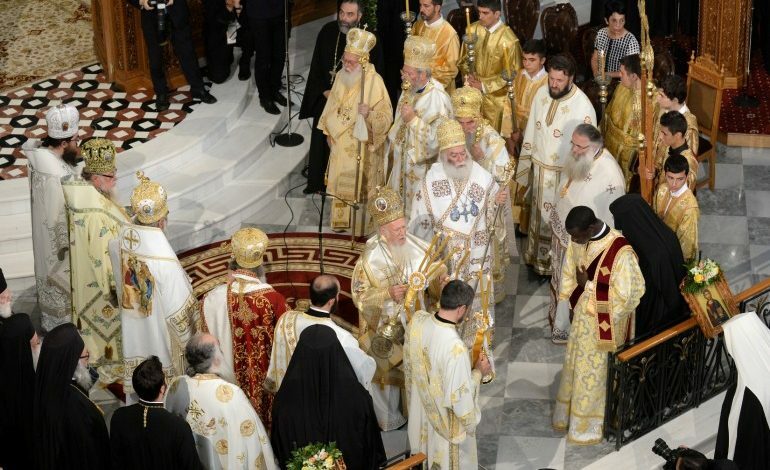 Two days before the Council ended, the Council spokesman, Archbishop Job Getcha of Telmessos, said the Council’s decisions would be binding for all churches, despite decisions by the absence of the Patriarchate of Antioch and the Orthodox Churches in Russia, Bulgaria and Georgia. Antioch had warned that it would not attend if its dispute with the Church of Jerusalem over the canonical jurisdiction of Qatar had not been resolved. All four absent Churches are now arguing that a pan-Orthodox council could not be convened unless all 14 Churches did not attend, and in a statement on 27 June, the Russian Orthodox Church said it may not recognise decisions taken in Crete. In addition, 15 observers from non-Orthodox churches attended the Council, including Cardinal Kurt Koch, who chairs the Pontifical Council for Promoting Christian Unity. However, the non-Orthodox observers, including Cardinal Koch, were only invited to attend the opening and closing sessions. For the rest of the council sessions, they were taken on cultural tours to places in Crete. “The Orthodox Church accepts the historical name of other non-Orthodox Christian churches and confessions that are not in communion with her, and believes her relations with them should be based on the most speedy and objective clarification possible of the whole ecclesiological question – most especially of their more general teachings on sacraments, grace, priesthood and apostolic succession,” the document added, without making a direct reference to the Roman Catholic Church. Each Orthodox Church was invited to send up to 25 bishops and six advisers to the Council. Nine women were included among the 290 delegates for the first time at a major Orthodox meeting. The details of running the council were finalised earlier this year [January 2016] by the Orthodox Synaxis, or assembly of Orthodox primates, after a century of on-off planning and decades of preparations that began in 1961. The Synaxis of Primates met at the Orthodox Centre of the Ecumenical Patriarchate in Chambésy, Switzerland. The Primates of the local Orthodox Churches and three official delegations from the Church of Antioch, the Church of Greece, and the Church of Poland met to finalise the texts for the Council. Initially, it was planned to convene the council in Constantinople (Istanbul). But, because of heightened tensions between Russia and Turkey, the venue was moved to Crete, which is part of the Ecumenical Patriarchate rather than the Church of Greece. However, one notable disadvantage was that the delegations were hosted in different hotels, making it difficult for them to network or arrange meetings. Metropolitan Kallistos Ware of Diokleia, who is based in Oxford and is perhaps the best known Orthodox theologian in the English-speaking world, was one of the participants in the council. The Rev Dr John Chryssavgis, Archdeacon of the Ecumenical Patriarchate, and Dr Brandon Gallaher, of the University of Exeter, have pointed out that in the past 1,200 years, many Orthodox teachings have remained suspended, undefined at a universal conciliar level. These include the teaching of deification (theosis). The end of Christian salvation in Christ is that all might become “partakers of the divine nature” (II Peter 1:4). Related to this is the teaching expressed classically by Saint Gregory Palamas (1296-1359) that one can come to know God and be deified through direct participation in the divine energies that pervade creation, although the divine essence is utterly unknowable. It is the teaching of God transcendent and yet immanent, God inapproachable and incomprehensible and yet fully accessible and knowable. He hopes that this will be the first in a series of meetings, with regular meetings of the Holy and Great Council every three to seven years. Metropolitan Kallistos said the two most important documents were on the relation of the Orthodox Church to the other Churches and on the Orthodox diaspora or the position of Orthodox living outside the traditional territories of Orthodox national Churches. The document on the other Churches begins with an uncompromising statement to the effect that the Orthodox Church is the one, true, catholic, apostolic Church. He points out that the Roman Catholic Church has made a similar claim, although this was modified at Vatican II by saying in Lumen Gentium that the one, true, catholic Church “subsists in” the Roman Catholic Church. Professor Gavrilyuk has described how a number of delegates objected to the use of the term “Church” in reference to non-Orthodox Christians. The delegates of the Church of Greece claimed such use could be so controversial as to potentially lead to schism. But Archbishop Anastasios of Albania, who emerged as one of the most effective mission-minded voices at the council, appealed to the delegates not to give in to fear and intimidation. Metropolitan John Zizioulas, a representative of the Ecumenical Patriarchate, noted that the application of the term “Church” to non-Orthodox Christians was sanctioned by past use going back to the 11th century. Metropolitan John asked: “Is this assembly prepared to anathematise the Church Fathers [for using the term “church” in reference to non-Orthodox]?” The silence that followed indicated that the vast majority of delegates were ready to disown an overly narrow, fundamentalist reading of the patristic tradition. Metropolitan Kallistos also discussed the rivalry between Constantinople and Russia, and the reservations the Russians have about the claim of the Patriarch of Constantinople to the first place in the Orthodox Church. In the Orthodox tradition, no primate or patriarch can make a conciliar decision universally binding by virtue of his own authority. In Orthodox ecclesiology, this authority belongs to the bishops gathered at a Pan-Orthodox Council, as long as their decisions are properly received by the people of God. The council ended just a month ago [26 June 2016], and so the initial stages of reception have yet to begin. It may take lengthy discussions and observation before it is agreed that the Council of Crete is truly “Holy and Great,” or merely a prelude to something holier and greater that will eventually involve other Christian Churches in the years ahead.